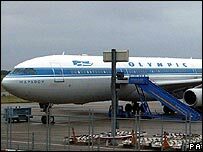 The Greek government has said that national carrier Olympic Airlines has a 'more difficult future' amid speculation it may soon be grounded. Athens is under increased pressure to reclaim illegal state aid that it paid to the airline. And Ryanair is taking the European Commission to court for failing to act on further state subsidies it alleges were paid to Olympic. The Greek carrier has struggled despite the widely-criticised funds. Athens has previously said that the demands for repayments have made it impossible to find investors for the potential privatisation of the airline. The legal action by Ryanair makes Olympic's survival "more difficult" Greece's Transport Minister Costis Hadzidakis warned. In a carefully worded statement following a meeting with EU Transport Commissioner Jacques Barrot over the weekend, he said that the government was committed to keeping Olympic in the air. But if it was forced to close, he pledged that none of the estimated 8,500 workers at the flag carrier would lose their jobs and that none of the Greek islands would lose their air links to the mainland. This has been widely interpreted that the troubled airline's days are numbered. Olympic has faced financial difficulties for years, despite being propped up by Athens. Efforts to privatise the carrier hit turbulence after a 2005 ruling by the European Commission that found the Greek government guilty of illegal state aid to Olympic and demanded it reclaim the money worth hundreds of millions of euros. The ruling related to subsidies given to Olympic between 1998 and 2002. Ryanair's complaint relates to a further 500m euros subsequently given by Greece to the airline, which the Irish budget airline alleges is the latest attempt by the government to support the carrier.